Digital mess for...kids? It would freak me out as a kid. The most of characters are ugly and creepy, even Alice looks like anemic half-dead. I would rather let kids watch Star Wars or Guardians of the Galaxy. These movies are creative fantasy-sci-fi and much less frightening and even if some characters die, it´s handled the way kids can deal with. I enjoyed this movie, a wonderful movie to watch. Those with imaginations and a hope that magic and fantasy really exist will appreciate this movie. The acting, costumes, scenes are all just perfect! A very good film. Only criticism is that it was a bit too long, and if they cut Alices trips in her time machine down to two trios, it would work. Sorry to hear of troubles with Depp, but it was a good performance. All very good animation, not much plot. Excellent portrayal of a strong woman. 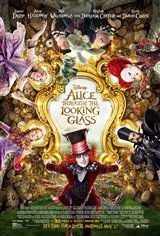 Love Johnny Depp and think he is under rated: having said that; I don't care for the person portraying Alice (in either movie) and this movie would have been better left in the can. S N O R E ...........haphazard and tedious, at best. excellent animation and interplay with characters. totally engaging esp in 3D! a great time away from the truly scary world we are living in! lol. One of the worst movie ever made, AWFUL!!!!! We loved it. It was lots of fun. As good or better than the first. Loved the colour and the wild imagination. All characters stories were well developed and effective. Enjoy! I liked every minute of this film, watch the first one first before you watch this one, It helps. A visual buffet. I enjoyed it a lot. Loved the movie. Visual was magical. Wish I was at the tea party! Loved this movie. Me and my sister went for the private premier in the Scotia Bank theater. It was such an awesome move. Johnny Depp did it again I was just amazed with his performance. Really fun movie, I hope there will be a part three!